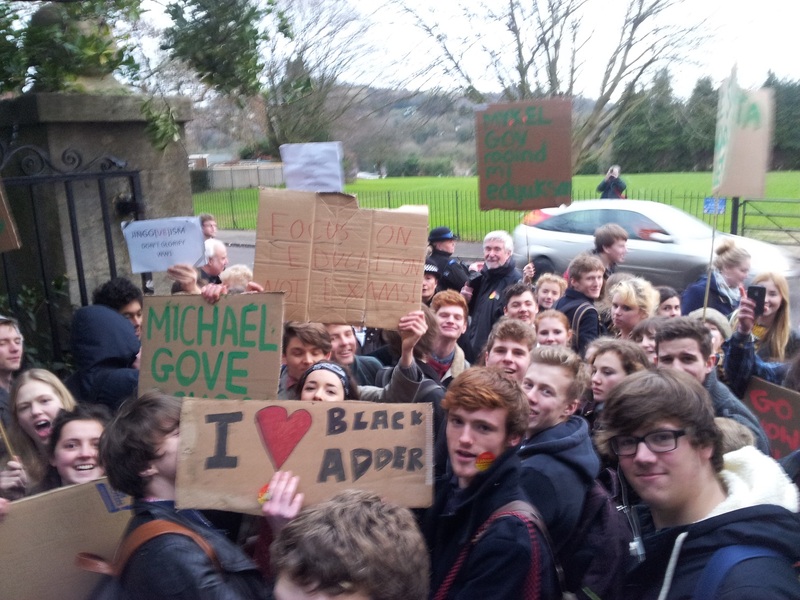 On Friday 10th January Michael Gove visited Gloucestershire for the second time in recent months. Stroud Against the Cuts received a tip-off he was due to visit Marling School in the afternoon, and arranged to meet at 3.15, half an hour before Gove was due to arrive. Stroud Against the Cuts' twitter account has more: https://twitter.com/StroudAntiCuts. Tomorrow, Friday 10th January, Michael Gove, Secretary of State for Education, is visiting Gloucestershire. outside the former Downfield Hotel (now Five Valleys Vetinary Service), next to Downfield Rd. Please join us if you are able - with placards etc. 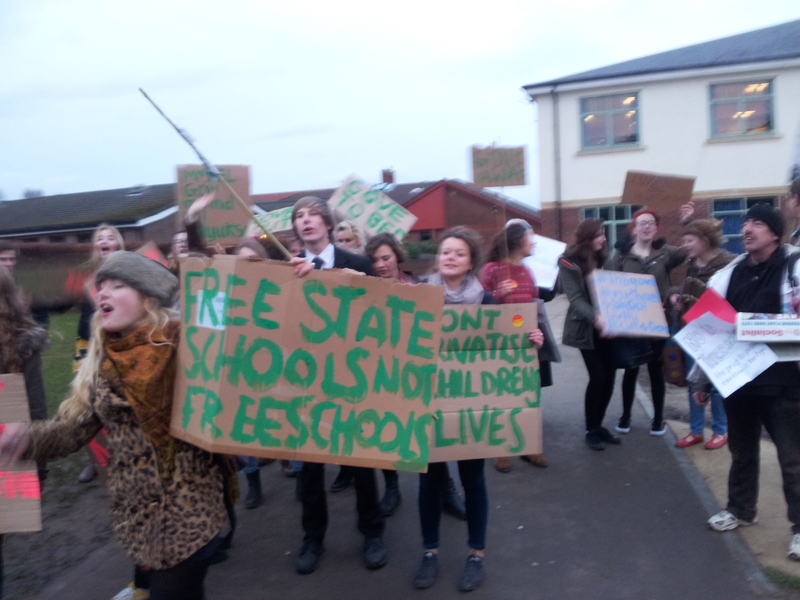 Why protest Michael Gove's visit? 79% of teachers feel that the Government’s impact on the education system over the last three-and-a-half-years has been negative. 82% of teachers and 87% of school leaders do not believe the Coalition Government’s academies and free schools programme is taking education in the right direction. Morale in the teaching profession continues to fall and three quarters (74%) of teachers say their morale has declined since the last General Election. 63% of teachers say that more than a fifth of their workload does not directly benefit children’s learning. 52% of teachers are less likely to stay in the profession as a result of changes to teachers’ pay and pensions, and 57% are less likely to stay as a result of changes to teachers’ conditions. 70% of head teachers do not feel trusted by the Government to get on with the job. 69% of teachers and 85% of head teachers feel they cannot work until 68. A leaflet from the National Union of Teachers is attached. In October last year, Teachers took strike against against attacks not only on our education system but their terms, conditions and pensions, see information here: http://stroudagainstcuts.co.uk/fightback/educationcuts/37-education/150-teachers-strike.html. Why has SATC been supporting this strike action? "Teachers’ pensions are not “gold-plated”, they are fair and affordable. £46billion more has been paid in than has ever been paid out! On Monday 15th October, over 20 members and supporters of Stroud Against the Cuts went to Sanger House in Brockworth to hear the result of the board of NHS Gloucestershire's final vote on the consultation process. The vote was unanimous in favour of establishing a new, standalone NHS Trust in the county - what SATC have been campaigning for all along! This is a victory for anti-cuts and anti-privatisation campaigners across the county, and thanks are due to everyone who helped the campaign in any way, including signing petitions, marching, donating money, writing letters and completing consultation forms. The campaign has taken almost 2 years now so a celebration is planned, before continuing to campaign against creeping privatisation across the NHS and destruction of staff pay and conditions. Stroud Against the Cuts will also be spreading the word about our achievement to inspire and motivate other campaigners to Keep the NHS Public across the UK. Please help to do this. For the full press release about the victory, see below. significant national implications, and the first decision of its kind. voting for the services to be run by an NHS Trust .